I can happily say this week has breezed by. Thankful for this Friday and a huge weekend ahead! Today I have my second Fashion Friday post.....ON FRIDAY....clap for me! I spotted another one of my fab BLM girls doing what they do best this week, looking fabulous of course. From the hair to the shoes, Alicia over at Chica Fashion really hit the nail on the head with this look. I'm a shoe whore so it's easy to see why this look stood out. Check her out! So what did I come up with? Index finger= shoulders, middle finger = denim shorts, ringer finger = shoes, and pinky = that hawt cut out on the back of Alicia's shirt. 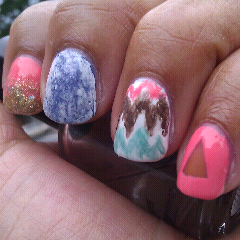 I intially tried a free hand, feathered chevron look (which you can see below) but it was an uber fail. guess I should practice my free hand a little more eh? 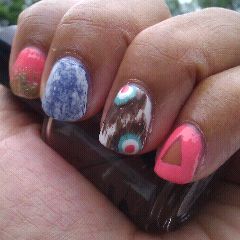 In the end I ended up with an ikat design on the ring finger. Not too shabby for someone who is trying to improve on her nail art. So how did I do? Head over to Chica Fahion. 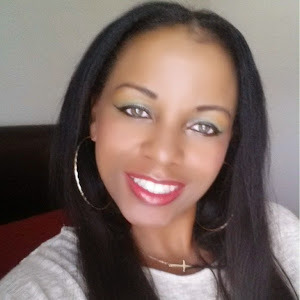 She has some nice accessories for sale on the boutique side of her site as well. Have a great Labor Day Weekend! FYI: Ulta will have Butter London polishes BOGO on Monday!!!! OH my wordddd... I can't believe you created this!!!!! I didnt see u post these on Instagram!!!! This is soooo creative!!!! Great Job!!!! Loving the outfit as well!!!! 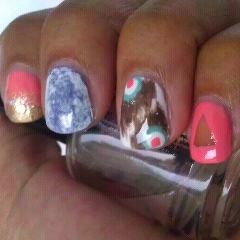 Thank you so much for featuring me you did a fab job I'm super happy my outfit inspired such a creative and cute mani! My pleasure. It was rather fun!